LiveCode LessonsLiveCode LessonsHow To - LiveCode Mobile Tasks LiveCode Mobile TasksHow do I Capture Images in LiveCode Mobile? This lesson describes how to detect the camera features of iOS and Android devices and take photos from cameras that are available. Screen captures and sample code are provided. iOS and Android devices come with a number of features that can be accessed via LiveCode. In this lesson we will see how to detect what camera features are available and how to tell LiveCode how to use the camera features. Taking a photo with LiveCode launches the native camera control interface on the iOS and Android device and then returns control back to LiveCode. 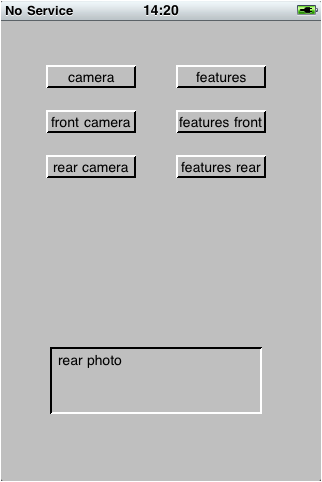 In this example we create six buttons that allow you to probe a device for available cameras and take photos using the cameras that are available on the device. The six buttons have the following code associated with them. put the result into image "The_Image"
put the result into field "The_Result"
In a purpose built application you may want to combine the commands and raise custom dialogs to inform the user what cameras, if any, are available. You can detect all of the camera features that are available by selecting the features button, as is shown in the above figure. This would return a list of cameras that are available or empty, if the device has no cameras available. 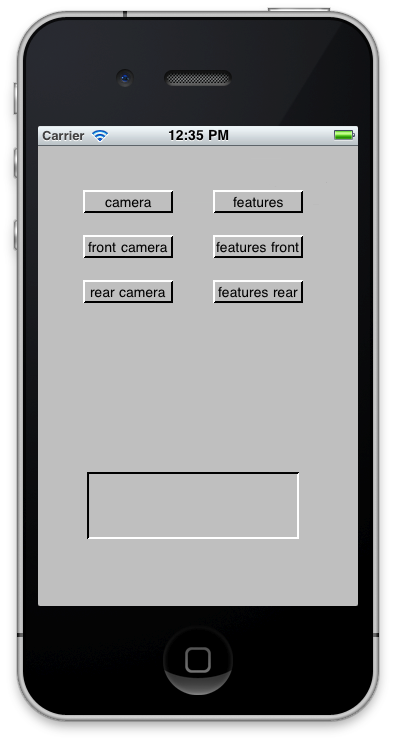 Similarly, pressing the features front or features rear buttons lists the features that are available to the specific camera selected, or empty if the selected camera is not supported. 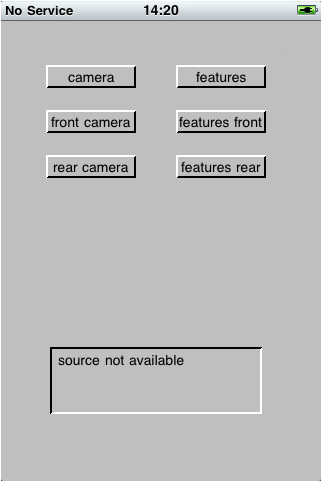 If a camera was selected for the purpose of taking a photo, and the devices did not support that camera, then mobilePickPhoto returns a string with the text: "source not available", as is shown in the above figure. If a camera was selected that was supported by the iOS device, then the native device camera control is launched, allowing you to take and retake photos. 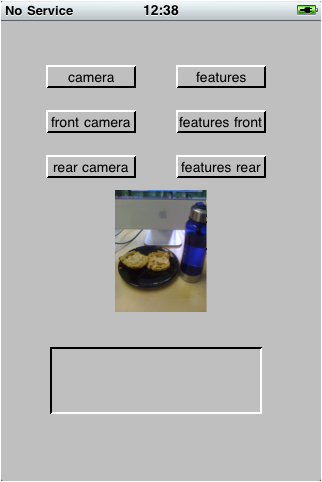 After you have taken a successful photo, such as the one shown in this example, control is returned to the LiveCode application. The size of the displayed images is controlled by parameters passed to mobilePickPhoto. Prev: How do I use the Question and Password Dialogues in LiveCode Mobile? Next: How do I detect a shaking motion using LiveCode mobile? Based on the new release notes, it looks like the mobilePickPhoto function is now supported. Right? Sorry... I misunderstood the android statement on the parameters. Would it be possible to take a photo automatically? Or is control lost from the app when going into "the camera app" or would it be possible to create an external that connects directly to camera, and automatically takes picture? if you are trying to take a photo through LiveCode then this is accomplished via the default photo application. There is no built in feature to do this. If you would like your application to run on iOS and Apple provides access to the camera through appropriate APIs, then I cannot see any reason why you should not be able to create an external that interfaces with your LiveCode application. This #comment is EXTREMELY annoying, as it offers no solution! Yes, I know it's in the Docs, but again, this is suppose to be a lesson for noobs. Thank you for your comment, I have updated the lesson to include your suggestion. Just starting out with LiveCode and trying to develop an app that relies heavily on GPS, camera etc. However, I noticed that the mobilePickPhoto function throws an unkown handler error in the IDE. Is there a way you can test that without the emulator (haven't tried that yet, it's VERY slow)? Perhaps install extra library or so? The best thing to do when using mobile only commands in your stacks is just to put an if statement around them, which checks the environment function, so that they are only executed when your app is running on a mobile device or sumulator. In the IDE you can either do nothing, use a placeholder control or default data or use a desktop equivalent e.g. Yes, these commands use the native controls provided by the OS so for testing on iOS or Android you need the iOS simulator or Android emulator, or a physical device of course. I'm glad to hear you are enjoying working with LiveCode, all the best as you dive in deeper. If you have any questions or our lessons please do ask here, or at StackOverflow http://stackoverflow.com/questions/tagged/livecode, or on our forums http://forums.livecode.com/ if your question is more general or not on a specific lesson. There are always community members willing to help out. I just tried to follow this lesson. 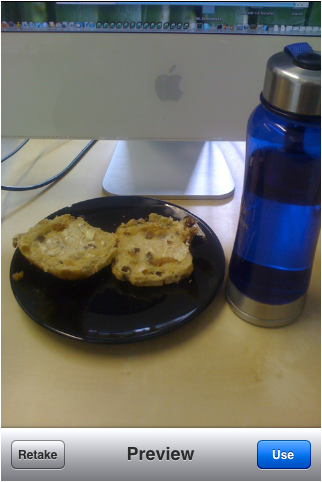 There is an error in the example, there is no result, instead the result of mobilePickPhoto is a new image. put the result into fld "the_result"
put the last image into image "the_image"